With white alpaca and circular needles, CO 80 sts. Join being careful not to twist. Change to red wool and knit in St st for 4 inches. Begin dec rows as follows (when diameter gets too small for circular needles, change to the double pointed needles). Knit 5 rows and fasten off. Make a white alpaca Pom-Pom (this method works well) and attach. I really like the way this hand-dyed red wool ended up with the slightest color variation. It lends a bit of texture and interest to the hat. The alpaca trim keeps the softest fiber on the forehead and ears where wool hats are likely to itch little noggins. Joy, that's awesome! You should totally submit your tutorial to OPT-- it's great (as a non-knitter it makes me think knitting is more math than I'm ready for, though! Oh I love it! I was thinking the other day how K needs a santa hat but I didn't want her to wear one of those store bought polyester onesm, kwim? 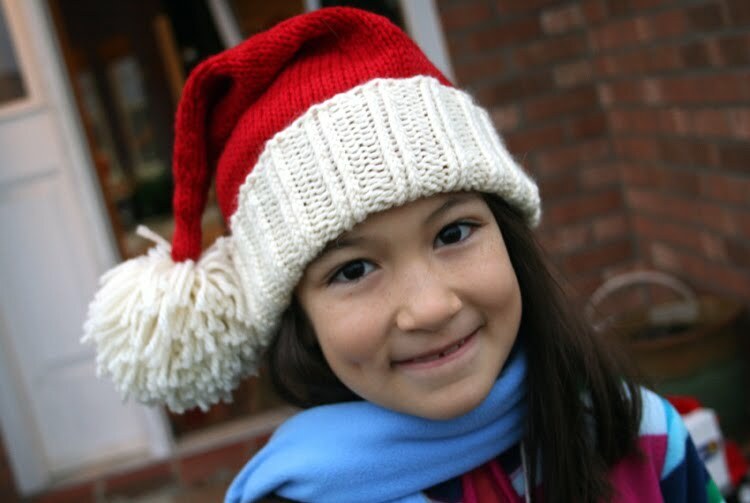 Wow, you and me must have been having some distant brain link up, because I started teaching myself to knit over the summer and about two weeks ago I figured out my own pattern to knit a kid's santa hat too. Freaky deaky! Mine is a bit smaller though, because it's for a two year old. 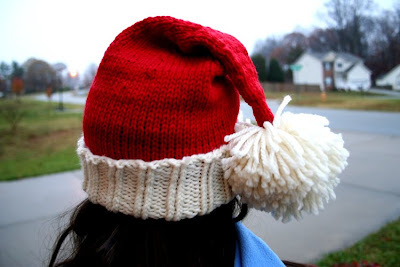 I shaped another hat slightly differently to make an elf's hat too. I guess I should blog about it and link to your hat too. I'm busy knitting giant socks to use as stockings at the moment :) I think that I have caught the knitting bug. Love your hat. It looks so cosy! Very cute. O.k, I've really got to get out those knitting needles and do some knitting! wow--that came out GREAT!!! would you consider selling them? it's the 1st kids' santa hat i really love! Of course another one for myself... Thanks for the patter! It started gaining popularity on the Big Bang Theory. Penny wore won for Christmas. Great idea. Thanks for sharing. 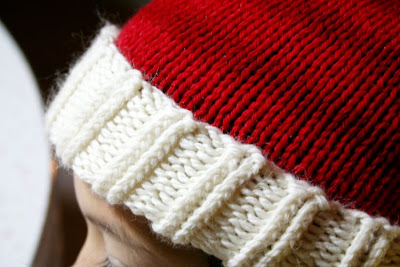 I made adjustments and made this into an adult hat... easy instructions and fun to make. Ty for sharing. Can you provide instructions to size this pattern to adult size? My daughter loves it.